Weddings are about sharing too! This post was featured on the Tangy Tuesday picks by BlogAdda. Weddings depict happiness, joy and all the other good things. But they also are a representation to show your social status to the society around you. Even in 2015, you see many many families being measured and judged by the kind of wedding they throw. You see people comment on how good X’s wedding dinner was sitting at Y’s. You see relatives whispering about the amount of gold that was given to a daughter. This is part of my Wedding Series. It is for a general audience and also addresses specific details about having a wedding in Chennai, India. It is biased towards a wedding set up where the bride/groom make final decisions as opposed to the norm where the parents make the call. Also, I am an NRI (Non-resident Indian) bride so there will also be tips on how to work things out when you are far away. It’s an all new series! Chennai is flooded, so is love, compassion and humanity! Every calamity in this world pains us and we always pray for things to get better. I was looking forward to starting off December on a happy note but it is disturbing to see my city being battered with rain. This has been happening for a few weeks now but somehow they got through it. The one this week seems especially bad and it is amazing to see the whole city helping out each other with flood relief, distributing food, doctors ready to help out pregnant women and sick people, Google forms going around asking people to fill their details if they can accomodate the ones whose houses are flooded into theirs, cabs/autos/people with big cars scouting the city trying to rescue those stranded or whose vehicles stopped functioning. I hope the city overcomes soon. Looking at all the humanity around, I am positive they will get through it. My prayers to the families who lost someone, who have been sick, whose houses are flooded and who escaped but have lost all their belongings in the water. I hope you find strength to overcome all this. A special thanks to all personnel who have been working day and night to clear the roads, rescue crews, policemen, traffic inspectors and everyone else! 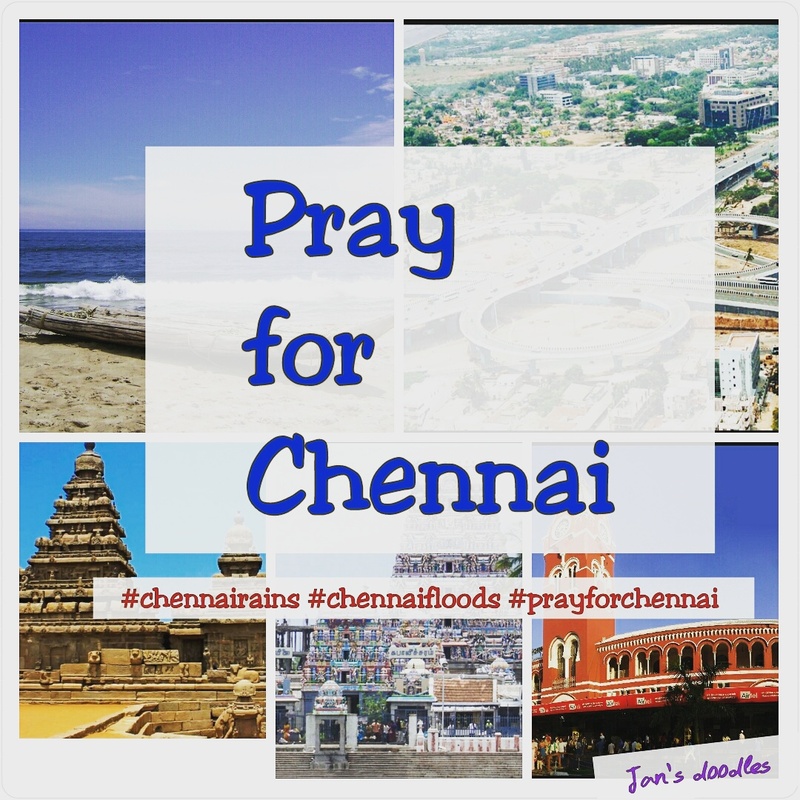 Being far away , I owe you this for keeping my family, friends and fellow chennaiites safe. So, if you are reading this and wish to help, this is what you can do. I, along with my friends were helping out those during relief measures on the ground last few days. We have a fundraiser set up in Milaap. We are personally verifying and distributing the funds to the volunteers who have been working hard the past week. The initial donations were made to help people and animals receive food. The current need is clothes, blankets, mosquito coils, sanitary needs and the long term plan is rehabilitation. Please help us in fundraising and helping our city get back on its feet. Even $1 will go a long way at this point. P.S: The biggest crib other than the fact that the roads have been constructed badly is that so-called national news channels did not cover the news about one of the major cities facing crisis. It’s okay newspeople , this motivated the whole city to connect with themselves using phones, social media hashtags, groups, hotlines etc etc. This proved that they don’t really need you to cover our city and update the. We have had amazing tweeters, bloggers, instagramers giving updates all day and helping Chenaiites.